On August 4, 2018, State Councilor and Foreign Minister Wang Yi held a briefing for Chinese and foreign media after attending the Foreign Ministers' Meetings on East Asia Cooperation in Singapore. Wang Yi said that two meetings were held this morning. One was the 10+3, the meeting of 10 countries of the Association of Southeast Asian Nations (ASEAN) plus China, Japan and the Republic of Korea (ROK), which constitutes the major part of East Asia cooperation. The other one was the 10+8, adding some countries outside the region, which forms the structure of the East Asia Summit (EAS). The ASEAN Plus Three Foreign Ministers' Meeting, held in a united and harmonious atmosphere all along, was very successful and smooth with three important consensuses formed. First, we should jointly safeguard free trade, oppose protectionism, and adhere to the multilateralism process. Second, with the establishment of the ASEAN community and the recovery and development of China-Japan-ROK cooperation, it is time to actively promote the construction of the East Asia economic community. 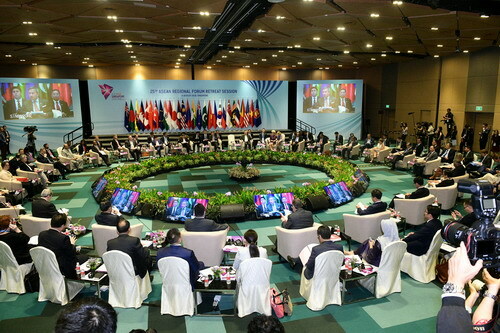 Third, given the current international political and economic situation, it is believed that the negotiations of the Regional Comprehensive Economic Partnership (RCEP) should be accelerated, and it is hoped that the RCEP can be signed or substantial progress will be made by the end of this year, thus serving the common interests of all countries in the region. Wang Yi said that at the 10+8 or the EAS Foreign Ministers' Meeting, we all realized that the region where we live is seeing both some positive progress and negative trends. There are two kinds of positive progress. The first one is that the Korean Peninsula nuclear issue has returned to the track of settlement through dialogue and consultation. All parties, including the United States (US) and the Democratic People's Republic of Korea, have reached important consensus on the denuclearization of the Korean Peninsula and the establishment of a peace mechanism on the Korean Peninsula. The Chinese side welcomes this positive momentum as it exactly echoes the Chinese side's proposition over the past years and also is in line with the basic direction China has been adhering to. The second one is that the situation in the South China Sea has become more stable with the joint efforts of China and the 10 ASEAN countries, We have not only fully and effectively implemented the provisions of the Declaration on the Conduct of Parties in the South China Sea (DOC) and carried out practical maritime cooperation, but also launched a hotline for communications between high-level officials and started to implement the Code for Unplanned Encounters at Sea. These are all good news demonstrating that the situation in the South China Sea moving towards stabilization. More importantly, China and the ASEAN countries have reached an agreement on the single draft negotiating text of the Code of Conduct (COC) in the South China Sea. In other words, if there is no external interference, the COC consultation will enter a period of fast development. All parties fully recognized these two kinds of positive progress. 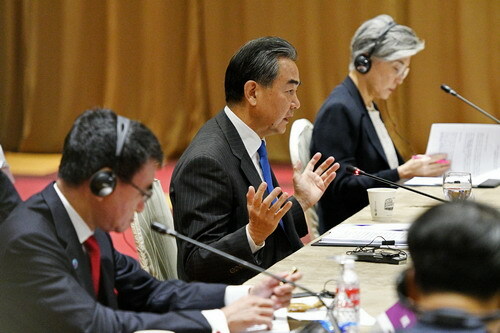 Wang Yi said that, on the other hand, there are also some negative trends in the region, mainly seen in two aspects. First, unilateralism and protectionism are on the rise, seriously impacting the free trade system and also threatening the development prospects of all countries and the well-being of the people. This is a serious problem that calls for our cooperation to address. Second, some countries outside the region, mainly the US, frequently show the military muscle by sending massive strategic weapons to this region, especially to the South China Sea, which poses security threat and pressure on the countries in the region including China and become the biggest driving force behind the militarization in this region. China, in the face of mounting military threats and pressure, is justified to exercise the self-protection and self-defense rights conferred by international law. Labeling self-defense measures with militarization is a typical mix of the right and wrong, which would be opposed by anyone who understands the basic facts. Wang Yi said that as in the previous two years, the ASEAN Plus Three and the EAS Foreign Ministers' Meeting presented a very sharp contrast. All countries in this region sat together to hold meetings in a very harmonious and friendly atmosphere. All meetings, including the ASEAN Plus Three today, focused on cooperation. No one mentioned the South China Sea issue since we all know that we are moving towards the right direction. However, at EAS Foreign Ministers' Meeting held in another room, the countries in this region still maintained a peaceful and cooperative attitude. But the meeting was spoiled by some countries outside this region by making irresponsible remarks for the purpose of undermining stability of this area, which was very regrettable. Wang Yi said that the protagonists of this region are the countries in this region which have the most say to judge the current situation and promote regional cooperation. I hope that the countries outside this region would change their mindset that only they can be the judges. They should understand and support the active efforts of China and the ASEAN countries. Disregarding efforts of China and the ASEAN in promoting regional peace and stability in the South China Sea is, at least, a disrespect for the countries in this region, which is also very irresponsible. Wang Yi said that US Secretary of State Mike Pompeo attended the Foreign Ministers' Meetings on East Asia Cooperation held this year. I held a bilateral meeting with him yesterday. Both China and the US are permanent members of the United Nations Security Council and shoulder significant responsibilities for regional and international peace and security, and both countries should maintain regular strategic communication. I have noticed that Secretary of State Mike Pompeo has made some remarks recently that the sovereignty of each country should not be threatened and that the US will not seek a dominant position in the region. This statement is indeed rare and uncommonly heard given what the US has done so far around the globe. It is hoped that the US side would honor its commitment and put the above important statement into tangible actions.